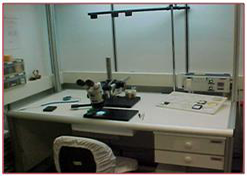 Workstation type TB-SL-2000 is use for manual eutectic soldering of components, using different soldering procedures according to user standards (as Au / Ge, Ga / As etc.). The system is also allows eutectic soldering without any performances (as Silicone components soldering). The unit can be use for a verity of components soldering as MIC, RF devices and micro-electronics components. Soldering is done under clean environment of Forming gas (or other, according to customer process). Mixing Gas Pressure 1.0-2.0 bar.